My granddaughter Shelby (who turns seven this February) spent another weekend with me, and on Saturday night, I took out my basket of Care Bears, spread the toys over my bed, and Shelby fell in love. She’d never played with Care Bears before, and it was love at first cute for those adorable plushes. 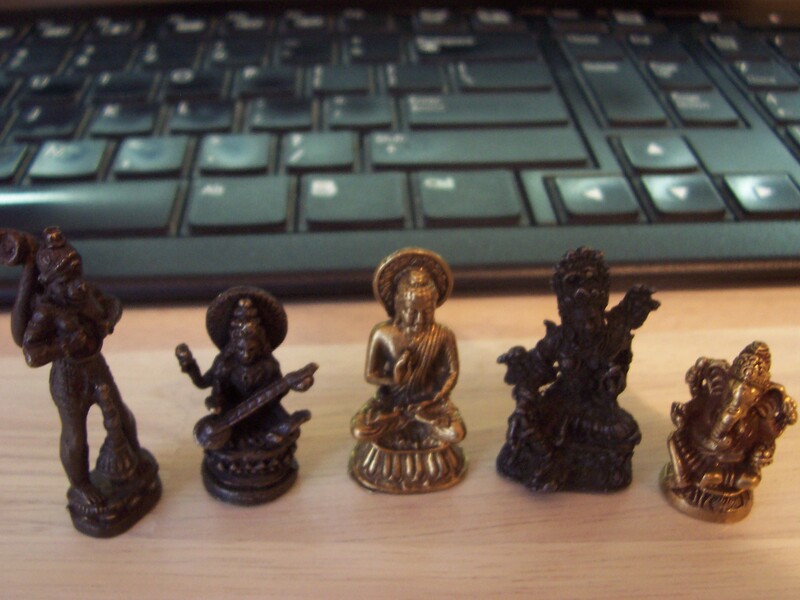 I also opened my little orange sparkly bag of Hindu murtis, and let Shelby play with those as well. 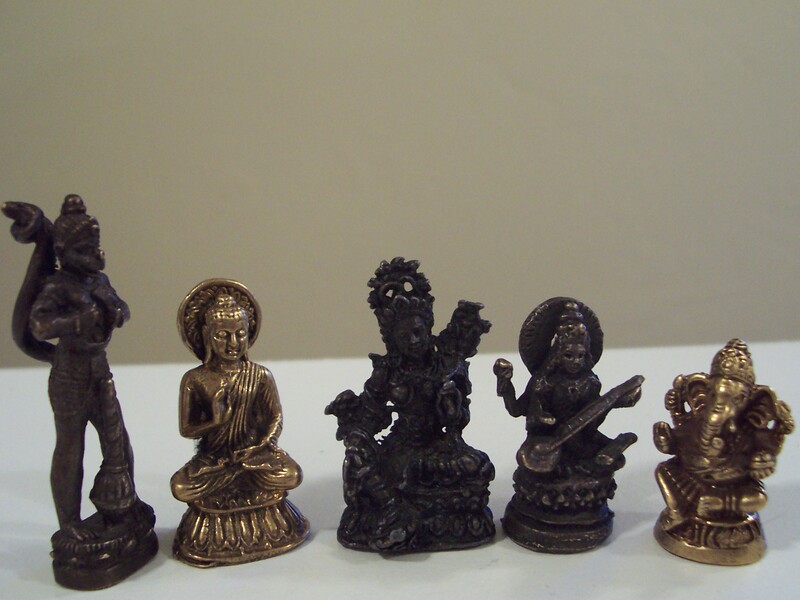 As you can see, these are tiny metal statues of Hindu deities. I used to have a few more, but sometimes people ask if they can have one and I’ve let a few leave my possession over the years. I have Hanuman, the monkey god (he has the monkey face and long tail). There is my beloved Ganesha, the remover of obstacles, with his gorgeous elephant head. The goddess Saraswati, playing the lute. A slender Buddha murti (which could also be Shiva or Vishnu or Rama — I bought these murtis at an outdoor table in Ladakh and cannot claim to be an authority on Hindu deities — I would like to call that statue Rama but the simple clothing and circular head frame make him more Buddha-esque than Rama). And then I have what is perhaps a Lakshmi goddess — but with the less-than-stellar quality of these metal castings she might be a Durga. Goddess of Power, Creation, Destruction. The Black One. Destroyer of Evil. Force of Time. Often depicted with wild rolling eyes and a long red tongue, wearing a necklace of demon skulls, holding severed heads, bloody weaponry, standing atop corpses (and often Shiva’s prone body) — this goddess speaks to my soul the way no other deity ever has. When I look at pictures of Kali, something tight and small and scared inside me relaxes and breathes, making me larger and infinite. In some beautiful alternate world, I grew up worshipping this goddess, praying in an ancient wooden temple full of incense and passing around bowls of fresh blood. Blood sacrifice has long been associated with the worship of Kali, and while I understand that people might look at this goddess and feel revulsion, I don’t see anything about her iconography or worship that is any more disturbing than, say, Christians “drinking the blood” and “eating the body” of a deity called Jesus Christ. Religion is full of elements that outsiders often find bizarre and disgusting. I grew up with Christianity, so the idea of “eating God” was very much normal to me, and I do love Jesus a lot. Christian hymns and prayers are woven all through my history. But if I had to pick any one deity to worship, then I would say my soul belongs to Kali. Like so many people, I’ve always struggled to identify myself with a single label when it comes to my spirituality. While many millennials check “none” in the self-identity box of religious affiliation, I would rather check a box marked “all.” Christian? Yes. Buddhist? Yes. Hindu? Yes. Agnostic? Yes. Atheist? Yes. Muslim? Yes. Pagan? Double yes. The only spiritual label I could never check is “fundamentalist,” because there are hideous things in all religious texts that I could never interpret or support in a literal, fundamentalist way. Things like slavery, caste, stoning women, and killing non-virgins. But the spirit of compassion and joy, pain and dark truth that runs through all religions — absolutely, I love them all. In August, I started attending the Unitarian Universalist Fellowship of Durango, fell in love with the church, and have been a regular presence in the building on Sunday mornings ever since. This morning, I signed the membership book, and officially became a member of the UUFD. Inside this house of fellowship, I can be an “all.” And no one tells me I am weird, or stupid, or that I’ll burn forever in Hell. Because I know many Christians who continue to warn me that only Satan would whisper in my ear that I could love any other form of divinity if I love Jesus Christ. While I do appreciate that so many people want to save my soul and make sure I “get into Heaven,” I need to be allowed to love all religions, as well as atheism and agnosticism and humanism, and express my love for life in all ways. And the UUFD allows me to do that. The sermons are expansive and open, and encompass all faiths. As a child, I often found attending church to be awkward and painful, something I’d never choose to do on my own — but my granddaughter Shelby freely chooses to attend the UUFD with me. On weekends she stays the night, she wakes up extra early on Sunday mornings, she’s so eager to go. And today, Shelby was *really brave* and went off with the other kids, to the children’s room, rather than sitting with me for the sermon, as she normally does. I was really proud of her, and she had a great time singing and dancing with the other children. You might think I promise Shelby ice cream, or bribe her in some way, but she gains no extra goodies as a “reward” for attending church with me. She could stay home and play, or sleep in, or watch cartoons, and life would be exactly the same for her. It amazes me that any almost-seven-year-old would be so eager for church that she’d wake up thrilled for Sunday service, and turn down watching cartoons to spend two hours at fellowship — but such is the magic of children. 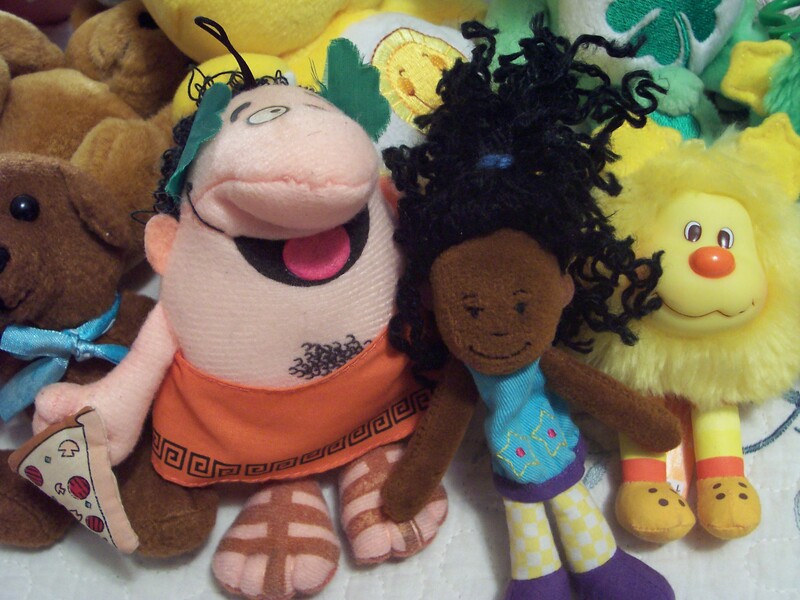 Shelby chose to leave Little Caesar in the car, and took only the girl finger puppet inside. Reverend Katie, greeting us at the door as we entered, noticed Shelby’s doll, and said, “I really like your doll,” and Shelby didn’t respond because she is often quite shy. And yet, here was Shelby, making her own choices about what she was drawn to in her play, and I thought of these innate drives we all have within us, the recognition we each have for our own loves, our own truths, our own joys. Children keep us awake, and open, and remind us that we are all born with ancient wisdom inside us. We are holy and profane, we are perfect and deeply flawed, with hearts and minds in constant motion, our bodies full of sacred music, harmonies and energies that power our lives. I call that my No Coffee Selfie. Today though, I had coffee. No need for anyone to run in terror. After Shelby and I came home from church, while we were waiting for lunch to finish cooking, I was reading a book on the couch, Shelby was playing with the plushes again, and she brought Little Caesar over to tell me that he has “curly man hair on his chest.” I said, “Yeah, he’s like Grandpa Greg,” because my husband has lots of curly man hair on his chest. And I thought of how funny life is, concerning what we see in the world, and when we see it. Perception is as tricky as memory. Shelby had spent all that time playing with this doll, and then suddenly noticed the man hair on his chest. In so many aspects of our lives, we can look at something and look at something, and still not see every detail. I do this all the time as an adult — my limited perception is something I become more and more aware of each year that goes by. To me, this is another beautiful aspect of children — they remind us that we all do this, and always have. There is tremendous compassion involved in accepting that fact. As the sun set this evening, and I drove Shelby home for the night, I thought about the wild abundance in the world, how life can be so squalid and hard and difficult, full of agony and pain, and yet it’s always giving, just giving and giving, a profusion of energy that never stops moving, whirling and roiling in the most intricate patterns. I often forget that, then remember, forget again, and remember. But I do always try to be thankful. (When I remember.) That was my New Year’s resolution this year — to greet all setbacks and hardships, large or small, as gifts, and to acknowledge them with two words: thank you. Who or what am I thanking? Anything, everything. The universe. God. Goddess. The two merged together into one body. Energy. Shadow and light. I can’t promise I’ll remember to say thank you all year. On the last day of January though, the resolution is still very much on my mind. One month into 2016, and I’m still reaching for this goal. Bodies in motion without a stage. And the older I get, the more I admire it all. When I remember, that is. When I’m walking that fine line between perception and memory, and looking for truth in the margins. Beautiful post. Love so much that you’ve found an expression of faith which makes you content!! Such a very important moment! My favorite from this and what I’ll be reflecting on today: “we are all born with ancient wisdom inside us. We are holy and profane, we are perfect and deeply flawed, with hearts and minds in constant motion, our bodies full of sacred music, harmonies and energies that power our lives.” So very true! !